If you’re interested in Spanish ‘Modern’ history, you may want to head over to the Círculo de Bellas Artes for its latest exhibition: Post War: Propaganda and Publicity. 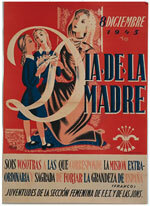 On show are over 200 posters and other memorabilia which show the close connection of the Franco regime with business. The exhibition runs until the 20th May.